Pop star Justin Bieber could spark a surge of interest in private spaceflight if he ever launched into space, one scientist says. PALO ALTO, Calif. — Just call him the Biebernaut. 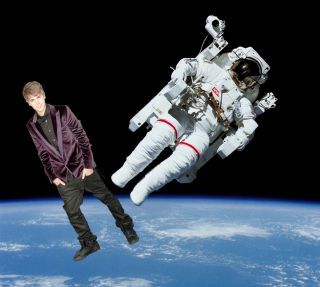 An astronomer is making a case for launching pop singer Justin Bieber into suborbital space aboard a private rocketship. The idea is not to rid the world of the Canadian teenager and his pop stylings — he would come back down to Earth eventually, after all — but rather to help jump-start the emerging suborbital spaceflight industry. Lofting a celebrity of Bieber's stature would generate a lot of interest among the American public, which could help commercial spaceflight pick up some much-needed momentum, said Seth Shostak, senior astronomer at the Search for Extraterrestrial Intelligence (SETI) Institute in Mountain View, Calif.
"My suggestion is, be sure to send Justin Bieber on one of these flights early on," Shostak said here Tuesday (Feb. 28) during a presentation at the 2012 Next-Generation Suborbital Researchers Conference. "If there's more interest, there are more customers. If there are more customers, there's more technical development. It's a positive feedback loop, and obviously that's good." The commercial space industry consists of a handful of companies — including Virgin Galactic, XCOR Aerospace, Blue Origin and Armadillo Aerospace — that are developing vehicles to take passengers and payloads on brief trips to suborbital space. Such missions would return to Earth without completing a full lap around the planet. Instead, the flights will hit the edge of space about 62 miles (100 kilometers) above Earth, experience a few minutes of weightlessness, then re-enter the atmosphere and land back at a spaceport. None of these firms are ready to fly customers yet, but some are getting close. For instance, Virgin Galactic hopes to begin powered test flights of its SpaceShipTwo vehicle later this year, with commercial operations perhaps beginning in 2013 or 2014. It is SpaceShipTwo that reportedly grabbed the attention of Beyonce and Jay-Z, according to British tabloid The Sun. Virgin Galactic has collected deposits from nearly 500 customers willing to pay $200,000 for a ride aboard SpaceShipTwo, and both Virgin and XCOR have inked deals to fly scientists and their experiments on research flights. So a suborbital market already exists — but Shostak is thinking about ways to make it grow. A celebrity launch isn't Shostak's only idea. Suborbital firms should also promote their activites aggressively via social media, Shostak said, and they should make sure their spaceships are bristling with cameras both inside and out, to give the public dramatic views of every mission. Companies could also help stage a reality TV show, in which contestants vie for a trip aboard one of their vehicles. And if Hollywood could be convinced to make a movie about suborbital spaceflight, all the better. Films have a profound effect on people, Shostak said, noting that a bump in NASA's approval rating in 1995 may well have been due to the release of the Tom Hanks flick "Apollo 13" that same year. Some observers view commercial suborbital spaceflight as a potentially transformative industry, saying it could serve as a stepping stone to the exploration and exploitation of space on an unprecedented scale. While the industry's success is far from assured, Shostak offered some reason for optimism: The American public remains keen on space. "For every astronaut that's launched, there are 1,500 applicants," Shostak said. "If you're a certified public accountant, you probably can't make that claim."